GroundUp: Are residents’ associations being captured by the property industry? Sea Point shows how developers use these organisations to advance their own interests. By Gavin Silber and Sarita Pillay for GROUNDUP. The cost of a home in Cape Town’s historically white inner-city suburbs is rising faster than almost anywhere else on the planet. Along the Atlantic Seaboard — in places like Green Point, Sea Point, Bantry Bay and Fresnaye — prices climb 30% each year. Renting a two-bedroom flat in Sea Point can easily cost R20,000 a month — five times the entire monthly income of the average family in Cape Town. This trend has been good for some and bad for others. The winners are those lucky enough to have had the money to purchase property five, ten or 20 years ago. Today, they enjoy world-class public services and spaces — like the new R500-million Green Point Park and upgraded promenade — and huge returns on investments. If you owned property on the Atlantic Seaboard in the early 1990s it could be worth 1,000% more today. The less lucky are those who couldn’t afford to buy, and who now spend most of their income on rent or are expelled from the city altogether. Thanks to apartheid, the fortunate group is overwhelmingly white while the less lucky are overwhelmingly black. Real estate profiteering has a price and it is being paid by the domestic workers, security guards, municipal workers, construction workers, small business owners, clothing and textile workers and others who built and work in our city and suburbs. Many have lived in places like Salt River and Sea Point for decades. They survived the Group Areas Act, but are today being forced out by an unregulated property market and the greed that drives it. With this in mind, consider recent claims that the Sea Point, Fresnaye, Bantry Bay Ratepayers and Residents Association has been “captured” by property developers. Similar accusations were levelled against the Observatory Ratepayers Observation. Since then, that leadership has been replaced. The association claims to represent the interests of the wider community. This claim — and its acceptance by the City of Cape Town — grants it unique power over land-use planning, property development and other decisions that shape our neighbourhoods, and ultimately our city. So does the association represent the interests of the community or has it been captured by developers? Documents provided by the association in a statement last week help us answer this question. What exactly is a ratepayers association? Ratepayers’ associations (also called residents’ associations) are membership-based groups that represent the interests of people living in a particular neighbourhood. Most are not registered legal entities but have a constitution and work as voluntary associations. They can apply for Public Benefit Organisation (PBO) status with SARS which exempts them from paying tax. It is not clear whether the association has attained this status, but we do know that it applied in August 2017. Ratepayers’ associations provide forums to discuss local concerns, improvements to local services (sometimes through direct investment in services such as security and area cleaning), and liaise with elected representatives. An often overlooked but influential role they play is in reviewing applications for new property development. Ratepayer associations tend to be the first, often only, port of call when municipalities conduct public participation on land and housing issues. While the municipality must advertise some larger applications such as rezonings, many other applications are not advertised but rather sent directly to the ratepayer associations for comment (see Cape Town’s list of minimum advertising requirements here). In a city with a legacy of spatial inequality, who participates in deciding how urban land is used is crucial. But there is no legal reason why your local ratepayers’ association has any more authority than any other group. The only difference is that it has written to the municipality’s District Manager to register as an interested party under Section 83(b) of the Municipal Planning By-law (see summary here). Nothing stops you and your neighbours from following the same process. Once approved, your organisation must be sent the same documents for review received by traditional ratepayer associations. But until now this has not been widely practised. What does the association focus on? From an outsider’s perspective, the association’s prime concern seems to be countering what is often called “crime and grime”. According to the association’s most recent financial statement just over R1,000,000 of its R1,700,000 annual budget was spent on security operations and a further R200,000 on area cleaning services. Another issue that receives considerable attention in almost every ratepayers’ association meeting is homelessness or vagrancy. Some interventions include support and employment through partnerships with groups like Straatwerk. But the association makes no attempt to address the root causes of homelessness, which includes long-standing affordable housing and shelter needs in Sea Point and the City. Over the past two years the Sea Point, Fresnaye, Bantry Bay Ratepayers and Residents Association has not made a single utterance in support of affordable housing or temporary shelter accommodation in or around Sea Point. It has instead focused on moving homeless people out of the area, in some cases 30km away to a shelter in Delft. PlanCom handles all development applications. These can include requests to build higher, to subdivide/join properties, to demolish buildings with heritage value, and more. Its assessment on each case influences whether a development is approved (makes money for developers), stalled (costs developers money), or rejected (which costs even more money). Because the Sea Point, Fresnaye, Bantry Bay Ratepayers and Residents Association is often the only local community organisation the municipality consults with — especially when they don’t advertise — PlanCom often monopolises public comment on development in Sea Point, Fresnaye, and Bantry Bay. What is the evidence that this association has been captured? At least six of the association’s nine-person executive committee that we could identify in the 2018 AGM agenda have direct local and citywide business. Well-known names include Chairperson Marco van Embden (Chairman of BLOK property), his son Jacques van Embden (CEO of BLOK Property), and their industry counterpart Paul Berman (CEO of Berman Brothers Property). Both BLOK and Berman Brothers Property, with their head offices in Sea Point, have numerous commercial and high-end residential developments across Cape Town worth billions of rand, particularly along the Atlantic Seaboard, with others in the pipeline. Others with property interests on the executive include Suzanne Kempen (Director of Suzanne Kempen Property Management), and Ari Vayanos (Director of Arcamp Real Estate in Sea Point). Previous and current PlanCom members include the executive members and property, construction and development actors Paul Berman, Ori Saban, Ari Vayanos, and Jacques van Embden. Another member who served on the PlanCom is attorney and former SFB chairperson David Polovin, who has previously claimed that affordable housing on public land in Sea Point is “not in the interests of the community”. PlanCom regularly meets in the offices of property developers. Last year, almost all PlanCom meetings were held in “The Boardroom” of The Point – a building owned by the Berman Brothers which also houses their head office. In August 2017 Berman was thanked in an executive meeting for “facilitating a venue for PlanCom meetings”. Loaded with individuals with direct business interests in property, the PlanCom regularly reviews development applications that involve themselves, colleagues, friends, and family. Beyond what appear to be direct conflicts, the SFB received R500,000 last financial year from corporate sponsors. Its website lists as its primary sponsors Pam Golding, Dogon Group, Lew Geffen, Re/Max, Seeff, Durr, Knight Frank, Jawitz, Tyson, and the Real Estate Business Owners of South Africa. These real estate agents have a clear interest in supporting organisations concerned with maximising the development and turnover of new and exclusive stock. Does the association represent a wide and diverse constituency? 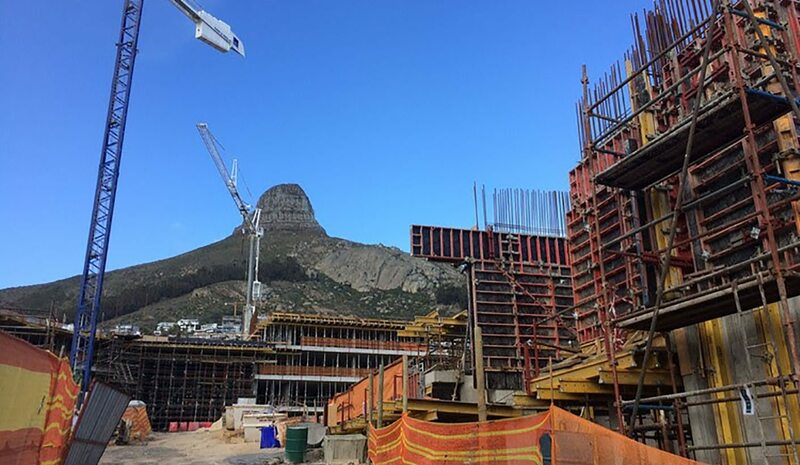 Last week’s Sea Point, Fresnaye, Bantry Bay Ratepayers and Residents Association statement, which strangely appears online on the Berman Brothers website, suggests that it represents 8,500 ratepayers in the area. But at last year’s AGM only 32 people were recorded to have attended or had a proxy (not including elected office bearers and guests). In the same statement Van Embden also claims that SFB “members are drawn from all walks of life” but the leadership seems to be made up predominantly of white men. At the time of the last census there were almost 5,000 black residents in the Sea Point, Fresnaye, Bantry Bay area. This is certainly not reflected in the Sea Point, Fresnaye, Bantry Bay Ratepayers and Residents Association’s leadership. This in suburbs with a dreadful history of racial segregation. Today it is one of the most rapidly gentrifying suburbs in South Africa. The authors are working on a series of investigations into Cape Town’s property industry. Views expressed are not necessarily GroundUp’s.